The project for the Italian Pavilion, incorporates some elements of my previous artworks, especially the use of the voice and sound, as a main element. Water, metal and voice are the three elements that make up the work. 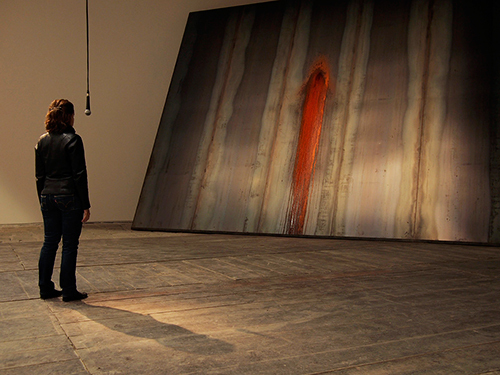 A performer is invited to use the voice through vocalizations, every day of the exhibition. 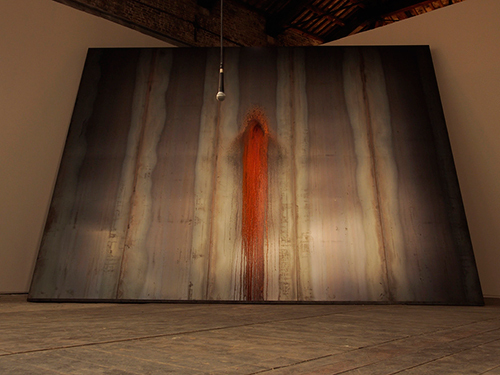 The constant daily action of the performer, interacts with the falling drop of water on the metal surface installed, which is a wall. 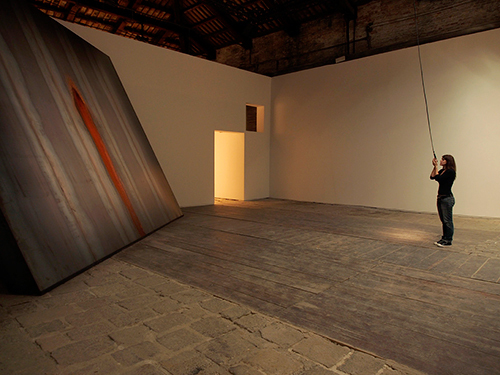 In this way, the installation will turn imperceptibly, day after day. Action after action, drop by drop, the water corrosion will take precedence over the metallic material, leaving the possibility to open a gap, which becomes symbolic or a real window into the reality that lies beyond the wall. The position of the performer is opposed to the front of the metal wall. Performer and wall are in dialogue. During the six months not only consume the metal, but also the voice of the performers will be sorely tested by this daily ritual. Movement of the drop and vocal presence are constants actions, which move parallel to a single goal, maintaining an indestructible constancy. Unlike my previous performances in which the action is exhausted in a short space-time dimension, this gesture is greatly dilated. Each visitor will be faced with a work in constant mutation, day after day until the end of the exhibition.